ANDROID VERSION NOW AVAILABLE FROM GOOGLE'S PLAY STORE! ClockItEQ uses the GPS technologies of the smartphone to record sectional times and heart rates for any exercising horse. This is available FREE from Apple's App Store, and from Google's Playstore. ClockItEQ records accurate heart rate, speed and GPS data for every training gallop performed by every horse, using an smartphone carried by the jockey. If jockey and trainer subscribe to the system, then data is transmitted live to the trainer trackside, or at any location in the world, and is uploaded to a secure server for later analysis. All data is encrypted for total security. Trainers can create reports on individual horses and choose to share these with the horse's connections. ClockItEQ has been custom designed to use the GPS features of the smart phone, integrated with the latest heart rate technology and a unique set of interpretative tools. The system is preset for a number of training centres, and is customisable to any track in the world. The interpretative tools allow trainers to assess a horse's current level of fitness, identify fitness trends, and identify over-training and health issues more quickly than traditional methods. ClockItEQ is designed for long term storage of data to allow maximum benefit of analysis from session to session, and campaign to campaign. Data is very secure, with the trainer having absolute control, but is also readily exported in customised reports. ClockItEQ's new server was released on 8th June, 2014 together with an updated version of the iPhone App. This allows trainers to set up ClockIt stables to hold data from all their horses. Trainers can then issue restricted access accounts to horse owners to allow them to share data with connections. Restricted access accounts can also be issued by trainers to their exercise physiologists and veterinarians, and other advisors. ClockItEQ is the best value fitness tool available in the world today. The entry level App can be downloaded at no cost from the App Store and allows sectional times to be recorded on a specified track. Heart rate data can then be added with the purchase of a compatible heart rate meter. The App is designed to be carried by the track rider and is the primary data logging device. The App also allows the trainer to access the real time track data of speed, HR and sectional times as the horse is actually running on the track. No further need for inaccurate stopwatches, simply focus on watching the horse and all the data required is accurately and securely recorded for later review. The system will even “speak” sectional times so that the trainer does not have to look away from their binoculars during a session. Subscribers are able to access the full record of any recorded exercise session at any time using their own secure log-in to our web-based data store. Data can be accessed and reviewed from any computer or mobile device. ClockItEQ new release in June, 2014 will also allow users to share session data in an anonymised format with other users via our ClockIt Forum. The forum is moderated by recognised world leaders in the field of equine exercise physiology and science. 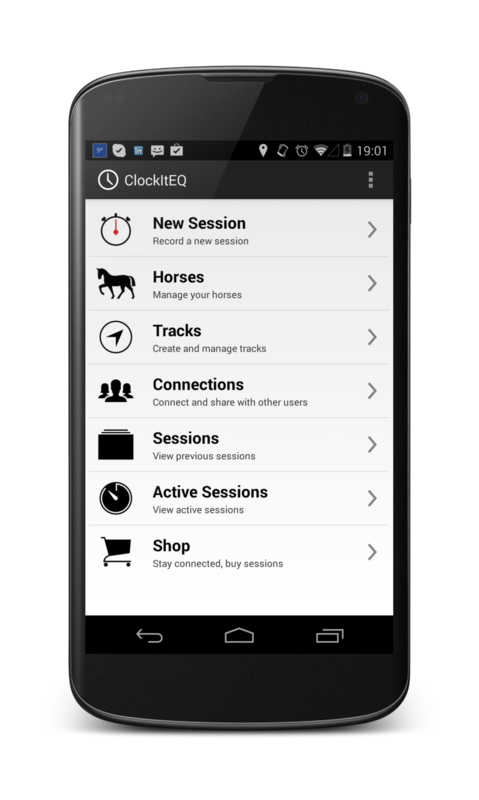 ClockItEQ brings the very latest training tool to every training stable. Comparable systems cost thousands of dollars and involve a large amount of hardware. ClockItEQ sits in your pocket and does the job without you having to get involved. Data service is currently priced on a pay-per-session basis, but an unrestricted usage monthly subscription service will be available from June, 2014. ClockIt is the way to measure success.